“procexp” is a powerful process explorer (or a monitor) that you can use in the GNU/Linux platform. If you’re someone like a system administrator who wants some additional power over your running system processes, then “procexp” can be an extremely easy to use & a powerful solution. The developer claims that “procexp” is the only process monitor that lets you access advanced details per running processes such as their CPU usage (of both the Kernel and the user based), network I/O activity and TCP/IP statics. Nonetheless, this is a very useful features, because, let’s say that you wanted to quickly get some idea of the “behavior” of your web browser (say Firefox for instance) such as its network usage history, CPU usage history etc, then “procexp” can help you with that :). It also has an option called “Set affinity”, which basically lets you assign (run) a process that will be executed using only a certain number of CPU cores. Because by default, if you have a multi-core or multi-threaded CPUs, then when running a process, that process might get switched between the each CPU core for optimal performance and system stability. However, this feature doesn’t seems to be working in “procexp”. Or maybe, it’s not fully completed yet as it’s in active development. *. One of the good things about “procexp” is that it has a pretty clean UI that doesn’t get you all confused :). And whenever you run a process for the first time, it highlights it in color Green and when a process is terminated, it’ll be highlighted in Red (for about a second). *. Shows both user based processes or all the currently running processes of your OS. *. Under each process, it shows the: Process name, ID, CPU usage, actual path of the process, user assigned for the process, Chan (“waiting channel” info) and the amount of threads of the process. *. As long as you have the proper privilege, you can right click on any process and: Kill it, Kill process tree, Suspend it, change priority (not supported yet) and “Set Affinity” value (also not implemented yet). *. 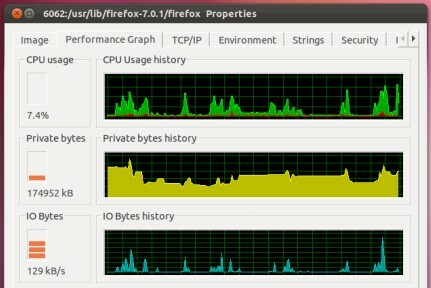 But most importantly, when you right click on a process and choose the “Properties” value, it displays a very useful, advanced details of that process (history based values) such as: It’s actual path and dependencies, CPU usage, Private byte, network I/O and the TCP/IP usage (the features of other “tabs” are not yet developed). And as you can see from the above screenshot, it uses graphs, therefore, it’s really easy to get a general idea of the behavior of a process as well. *. From its main menu, if you click on the “System Information” sub-menu, it opens a Window with graphs containing both the CPU usage and the Memory usage (including their history). And under the “CPU usage history” it shows: CPU usage for the past 1, 5 and 10 minutes, total number of running processes and the last executed ID of the process. And just below “System Information”, if you click on the “Physical Memory” menu item, it’ll show : Total, used, available, buffers and the Cached memory usage. *. Under the “Network Information” window you can get a network usage related information for all the network interfaces in your PC. *. You can also change the font size, update interval and the number of samples used to display the graphs using its “settings’ window as well. Installation of “procexp” in both Ubuntu Linux and Fedora is really easy thanks to the “.rpm” and “.deb” packages. The “.deb” package worked without any issues in Ubuntu 11.10 Oneiric Ocelot and it might work in older versions too. To get the packages, please go to this “procexp” home page, and if you use Ubuntu then get the “.deb” packag. And as usual, when the download completes, double click on it and the Ubuntu Software Center will install it for you. You can search for it in the Dash for launching (“process explorer” should do it). 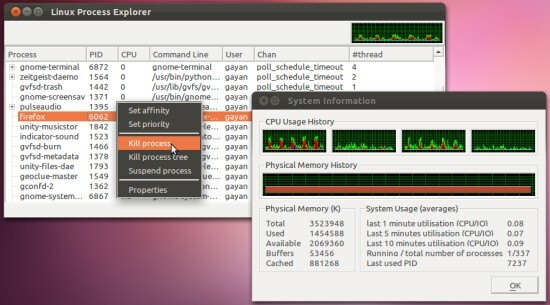 Although as mentioned above, all the features are not fully implemented yet, but still, if you’re looking for a simple and a powerful process monitor (explorer) that can be used in Ubuntu (GNU/Linux), then “procexp” looks like a very promising :). Good luck. Great Software really an unmatchable. Yep, it looks good :). This is not working if im not openning it as root, maybe a new bug…. but as user cannot monitor user processes !